Would you like to make more sales and generate more leads for your business? If so, did you know that leaflets can be a highly effective (and affordable) media to explore? But what happens if you’ve got disappointing results from your leaflets in the past? Does this mean you should stop marketing your business in this way? And you won’t be alone in this thinking. You see I’ve spoken with a number of entrepreneurs who raise this exact same issue. Despite investing money to design, print, and distribute leaflets, the sales are disappointing. Wondering why your leaflet failed? 1. No compelling, ‘no-brainer’ offer: Even if you have the best product/service in the world, your customers aren’t patiently sat by their letterbox waiting for your leaflet to fall into their hands. Now I know this sounds a little extreme, but that’s what a lot of marketing assumes! As a small business owner, I doubt you have the deep marketing budgets that a lot of the big brands have. As a result, you can’t afford to invest in brand awareness that doesn’t obviously translate into cash. Instead, you want a measurable return on your leaflet campaign investment and the only way you can do that is to include a compelling offer on your leaflet. When I say compelling, you’ve got to get your thinking right. Specifically, your offer should be something that gets your target customer hitting the phone because they MUST have what you’ve made available. 2. No deadline: It’s very hard to overcome ‘customer inertia’. We all lead busy lives and without a bit of a push, customers will be less compelled to take action. And that’s why a deadline can work so well. A deadline puts time pressure on your offer and assuming your offer is right, this action will increase your response rate. 3. Message not relevant: One of the biggest mistakes that business owners make is to create a generic message. And whilst I appreciate that your business could (in theory) appeal to a wide group of people, in practice that’s just not the case. It’s far more realistic to conclude that your business will appeal to a specific customer avatar – a type of person who you can best serve. When you look closer, you’ll find that your ideal customers have similar interests, similar fears, and similar desires. When you focus on creating your leaflet for this individual, your conversion rate will soar… because the people you want to attract will feel as if your message was written just for them. 4. Message too broad: Another mistake… trying to cram everything onto one leaflet! Whilst this is tempting, it can lead to confusion. For best results, focus on ONE THING. And remember, your leaflet doesn’t necessarily have to sell your end product. Instead, it must encourage your target customer to take the next step. So think about the process that your customers will travel through as they invest in your products and services and weave that into your leaflet campaign. 5. No call to action: When creating a piece of marketing you can’t assume anything. Remember, customers are unlikely to give your leaflet the same undivided attention that they will give their favourite magazine or paperback book. Instead, they’re more likely to skim and scan your message. And that means you absolutely must tell them specifically what you want them to do next. For example, do you want them to visit a web page or ring for more information? You need to be as clear and specific as possible when outlining this next step – if you don’t, your response rate will suffer. Another BIG area where business owners slip up is the copy on their leaflet. I know, it’s not easy to write copy! Hey, I’m a professional copywriter and still I never get it right at the first draft. It takes time to polish a piece of copy. And interestingly, in many ways the writing is the easier part! The hard part is the thinking that precedes the writing. In fact, you shouldn’t write a single piece word until you’ve put considerable thought into why your target customer will be interested in what you have to sell. So you see, your first step to write copy for a leaflet is to THINK. I promise that if you put the right amount of thought into your leaflet – and then plan out what content your leaflet will contain – you’ll find it a whole lot easier to write your copy. That’s because THINKING and PLANNING are the missing ingredients that will enable you put an effective leaflet together. But what exactly should you think about? And how do you plan your hook, angle, offer, deadline, and call to action? Now you could hire a copywriter to do this thinking for you. For example, if you were to work with me I’d ask you a series of in-depth questions to help me get at the gems that make the difference. In fact you could say that hiring a professional is the ‘safe’ option! But what if you want to take a few risks? What if you enjoy writing and want to do this yourself? What if you want to learn an easy way to get past the pain of the blank page and feel empowered to write thought-through copy whenever the need arises in your business? I understand that many business owners do want to create their own marketing material. Whether it’s to make their marketing budget stretch further or because they enjoy the writing process, many people do want to learn how to write effective copy. This 44-page, A4 printed workbook guides you step by step through the process of creating compelling content for your next leaflet campaign. 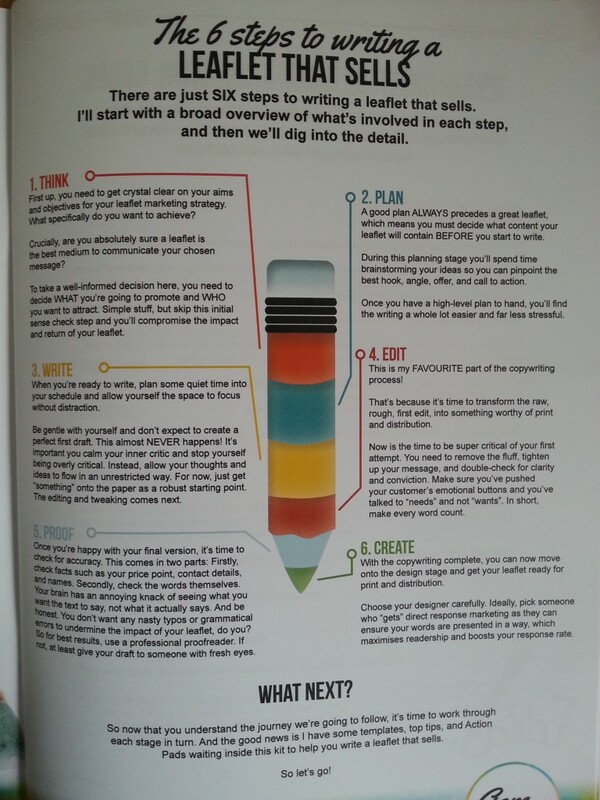 This DIY copywriting kit is designed to empower you to say the right thing, while guiding you away from the common mistakes which undermine your message. The guide leads you through the journey of putting pen to paper. 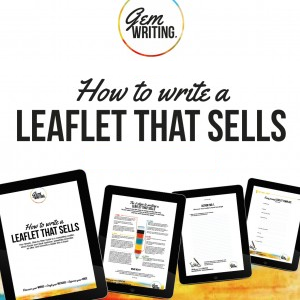 As a result, you’ll be equipped to nail down a firm structure and layout for the copy and gain the confidence that you can write a leaflet that sells. The DIY leaflet kit costs just £35 (+£3 P&P). With this small investment you could save endless hours of hard work and an untold amount of wasted marketing budget. You can grab your printed copy NOW via PayPal. Just click the button below. My new business, www.mybusinesshq.co.uk, has just launched and we want a really compelling leaflet that stands out to promote it…now I have the perfect tool, a step by step process and brilliant workbook. Thank you so much.